Covering almost three acres and sitting on nearly a full square block, theRodin Square development, a complex 520,000 square foot mixed use project, combines high-end residential apartments and amenities with health-oriented retail in a grand glass and brick fronted building to be located in Philadelphia’s museum district. The groundbreaking was held Wednesday, August 27 as representatives from Dalian Development, International Financial Company, the Philadelphia City Council, Whole Foods Market, MV+A Architects, The Harman Group and members of the community were present to celebrate the beginning of construction. Plans for the new complex feature 293 luxury apartments, 85,000 square feet of retail space including a Whole Foods Market, and 490 parking spaces. The ten-story residential development, Dalian on Fairmount Apartments, includes a hotel-style lobby with a 20-foot-tall glass façade, and shared public spaces including a billiards room, internet café, state-of-the-art fitness center and a yoga room. The residential amenities will also feature a 35,000-square-foot rooftop “Sky Park” with an infinity edge pool, an indoor/outdoor heated cabana, an outdoor kitchen with multiple grills, and a large green roof area. 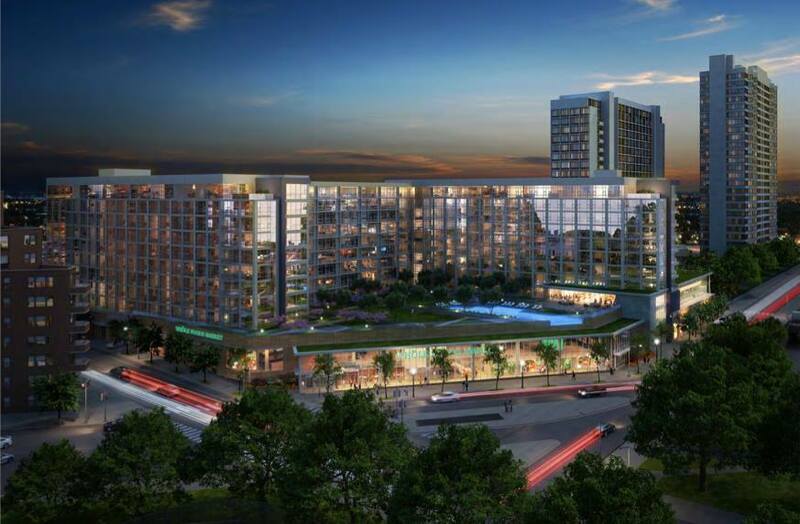 The street-level retail development, Rodin Square, will be the new home of a 60,000-square-foot Whole Foods Market featuring a 5,000-square-foot café and a two-story dramatic glass façade. Other tenants will include CVS/Caremark and Thomas Jefferson University Hospital. Read the full article at AIA Philadelphia.